Please also see our Facebook page for other information that might be of interest. Downeast Horizons will be holding their 5th annual fun color run in May. This will be the fourth year that Jones, Kuriloff & Sargent, LLC will be a sponsor. Come give us a shout at our table on Maddocks Avenue! The Blue Hill Peninsula Chamber of Commerce is hosting an event for business members to interact with the public at Parker Ridge and tell them more about services available to our community. We look forward to having a table there. Jeff will be one of three guest speakers at Birch Bay Village’s brunch and learn series on March 1st from 9-11am, along with Peter Sullivan and Dr. Vanessa Little. Rebecca will be presenting at Blue Hill Public Library at 5:15pm as part of Healthy Peninsula and Blue Hill Public Library’s Choices That Matter series. The presentation will focus on based ways to prepare legally for illness, incapacity, and death. Topics will include Powers of Attorney, Advanced Care Directives, Wills, and Trusts. 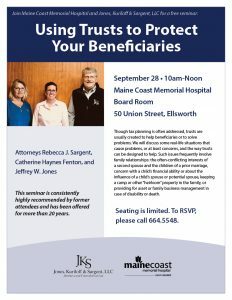 Jeff, Rebecca, and Catherine will be presenting at Maine Coast Memorial Hospital’s fall estate planning seminar from 10 a.m. – noon. This year they will focus on changes in tax law that have affected estate planning. 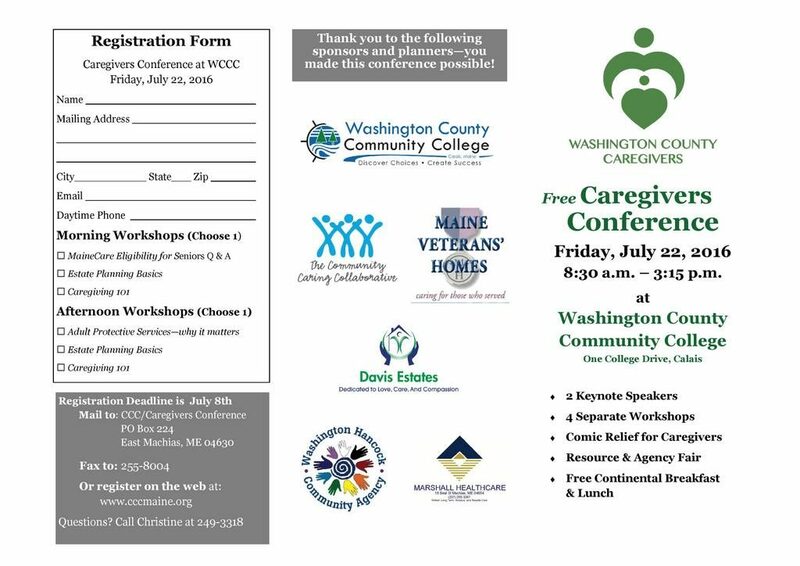 Pre-registration will be required as there is limited seating; please call the hospital directly at 664-5548. Jones, Kuriloff & Sargent, LLC is hosting the music for this fun event, held at Big Cat’s Event Center in Trenton, in addition to being a Silver Level Sponsor of the evening. We hope you will be there! The Ellsworth Chamber will host their annual meeting from 5-9pm at the DownEast Family YMCA in Ellsworth. Rebecca Sargent is a board member and Jones, Kuriloff & Sargent, LLC will donate a gift basket as one of the items to be auctioned off. Jones, Kuriloff & Sargent, LLC is delighted to sponsor the centerpieces for this year’s Maine Coast Memorial Hospital’s Chefs’ Gala. If the boss is delayed on a trip, can you still write checks? Process payroll? If the business owner is in coma, can someone else step up and take charge? Who has access to security codes for the building? Do you know where the keys are? Can someone negotiate the sale of the business if the owner will never be able to return? Jones, Kuriloff & Sargent, LLC is delighted to be a Silver Sponsor of the 27th Annual Maine Geriatrics Conference being put on by the University of New England. Jeff, Rebecca, Nic, and Catherine will be presenting at Maine Coast Memorial Hospital’s fall estate planning seminar from 9 a.m. – noon each day. Topics to be covered include: the basics of wills, probate, powers of attorney; on the second day we cover trusts and MaineCare asset protection planning. Pre-registration will be required as there is limited seating; please call the hospital directly at 664-5348. Jeffrey Jones and Catherine Fenton are pleased to be invited to speak at the Jackson Lab at an event geared toward their employees. They will give an overview of Powers of Attorney, Wills, and Trusts, and will talk about the pitfalls of using some of these documents without integrating them with all of the estate plan. The Ellsworth Chamber will host their annual meeting from 5-8pm at Big Cat’s Catering in Trenton. Rebecca Sargent is a board member and Jones, Kuriloff & Sargent, LLC will donate a gift basket as one of the baskets to be auctioned off. Jones, Kuriloff & Sargent, LLC is hosting the music for this fun event, held at Big Cat’s Event Center in Ellsworth, in addition to being a Silver Level Sponsor of the evening. We hope you will be there! Saturday, May 6: 10:15 a.m. and 1:15 p.m. Learn what methods exist for addressing confidentiality and conflict of interest issues when a single estate planning lawyer undertakes or continues representation for multiple generations of the same family under Maine law and the Model Rules of Professional Conduct. Jones, Kuriloff & Sargent, LLC is delighted to sponsor the flowers for this year’s Maine Coast Memorial Hospital’s Chefs’ Gala. Proceeds from the event will benefit new, 3D mammographic imaging technology for the Breast Clinic. Rebecca Sargent will be presenting a workshop on “Estate Planning Basics – What MUST you do to protect your family & finances.” It’ll be about strategies to give caregivers and family members the legal and financial resources to care for loved ones and themselves. This is a free presentation, but you’ll definitely want to register in advance. See their website for more information. In support of the family of Debra Ehrlenbach, Consultant for Jones, Kuriloff & Sargent, LLC. Special Children’s Friends, a local organization that helps children with special needs, asked us to be a lead corporate sponsor for their April campaign to raise funds for the Capital Campaign. The goal is to help fund a 42’x42′ addition to the current Ellsworth facility. The new facility will house two additional classrooms, a gross motor therapy room, and two handicapped-accessible restrooms. The estimated cost of the project is $332,000, and SCF will commit the remaining amount needed through organizational funds. Acadia Senior College has invited Jeff Jones to present on the topic of estate planning for a 4-week course in April. He plans to discuss why estate planning is still needed, even though the Maine and federal estate tax exclusions are $5.45 million and indexed for inflation. The dramatic increase in exclusions means that many people no longer have to do estate tax planning for tax purposes, but this change frees up time, energy, and resources to concentrate on what you really want to accomplish, how best to protect your loved ones, or ways to benefit your favorite charities. Powers of Attorney are still critically important. 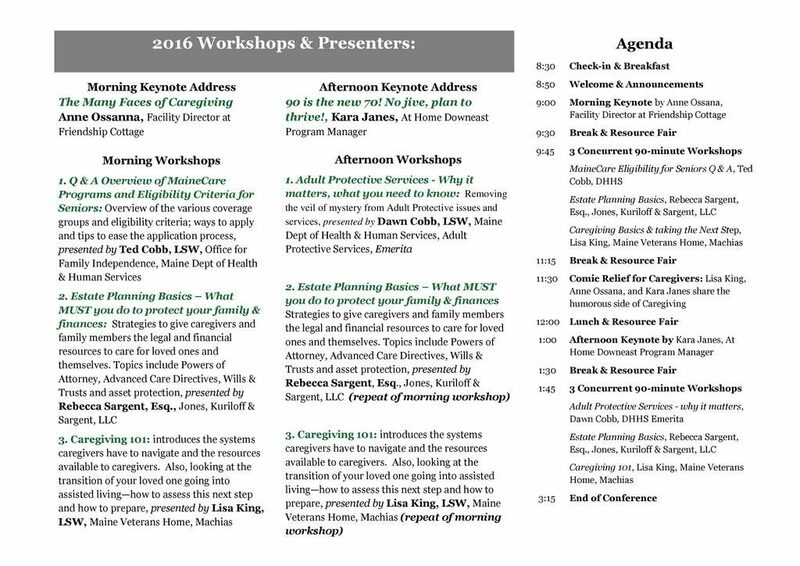 Jeff will again be a featured speaker at the 41st annual tax seminar at the University of Maine at Presque Isle (UMPI) on Friday, 10/28. This is an annual gathering of attorneys, accountants, life underwriters, and other financial professionals who seek to learn more about issues facing their clients. Jeff will present specifically on legal and tax planning for the transfer of a family business, whether it’s a sale to an unrelated party or passing the business on to the next generation. Rebecca has the opportunity to speak to a room of tax practitioners about the challenges of estate planning when you own a business. Her discussion points will be about disability planning, transfer of management versus transfer of ownership, valuations, techniques for transferring the business, and the documents you should have in place. Friends in Action will be sponsoring a week (10/3 – 10/7) of promoted events for seniors. On Monday, 10/3, at 1pm, Catherine and Rebecca will give a presentation called “What is Estate Planning” where they will review why this area of law exists, what the different types of documents are, and other special considerations. Throughout the week, we will have a display board up in the Atrium showing “Estate Planning Dos and Don’ts.” There will be a one-page flier to take with you if you’d like to bring this information home for further reflection. 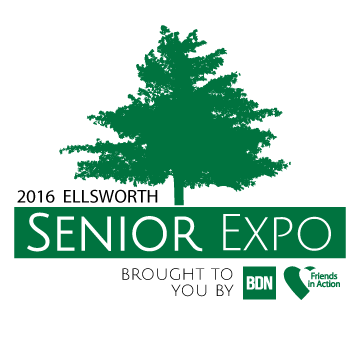 Jones, Kuriloff & Sargent, LLC is delighted to be a sponsor of the 2nd annual Ellsworth Senior Expo at the Ramada Inn at 215 High Street, Ellsworth. It will run from 9am to 3pm. There will be guest presenters and free giveaways for all who attend. Attorneys Nic and Jeff will give a presentation at 10am called “Fraud Facts and Defense.” They will discuss how people, particularly seniors, can protect themselves from fraud, first by being aware of the types of fraud being used and then by having appropriate documents in place. Jeff will speak to people at the First Congregational Church in Ellsworth on Sunday, September 18th, about general estate planning topics and also about how charities can be included in your overall plan. Rebecca will be presenting a workshop two times on the 22nd on “Estate Planning Basics – What MUST you do to protect your family & finances.” It’ll be about strategies to give caregivers and family members the legal and financial resources to care for loved ones and themselves. This is a free presentation, but you’ll definitely want to register in advance. See their website for more information. Jeff will be participating in the summer meeting of ACTEC. The American College of Trust and Estate Counsel is a national organization of approximately 2,600 lawyers elected to membership by demonstrating the highest level of integrity, commitment to the profession, competence and experience as trust and estate counselors. Jeff is one of an elite group of 25 lawyers that hail from Maine. 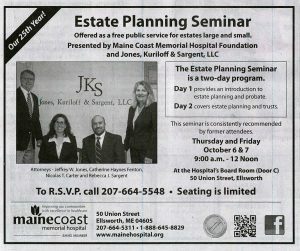 Jeff, Rebecca, Catherine, and Nic will be presenting at Maine Coast Memorial Hospital’s estate planning seminar from 9 a.m. – noon each day. Topics to be covered include: the basics of wills, probate, powers of attorney; on the second day we cover trusts and MaineCare asset protection planning. Pre-registration will be required as there is limited seating; please call the hospital directly at 664-5348. The Ellsworth Chamber will host their annual meeting from 5-8pm at Big Cat’s Catering in Trenton. 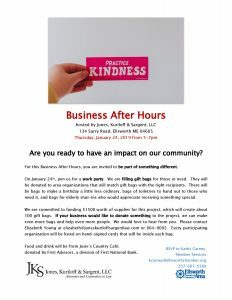 Rebecca is a board member and Jones, Kuriloff & Sargent, LLC will have a gift basket of gardening supplies as one of the baskets that will be given away. Rebecca and Catherine will be giving a talk about scams at the General Bryant E. Moore Center in Ellsworth at 1:30pm. This is part of the programing for Friends in Action, an organization that offers free services to elderly and disabled residents of Hancock County so that they can live independently, with dignity and a strong quality of life. Jeff and Rebecca will join Lauri Fernald of Jordan-Fernald Funeral Homes to give a free presentation at the library on Estates and Funerals. The public is welcome. Jeff will be again participating in the meeting of ACTEC. The American College of Trust and Estate Counsel is a national organization of approximately 2,600 lawyers elected to membership by demonstrating the highest level of integrity, commitment to the profession, competence and experience as trust and estate counselors. Jeff is one of an elite group of 25 lawyers that hail from Maine. Among other things he will continue to develop his skills in the field of international estate planning. Jeff will be a presenter at the 43rd Annual Frank M. Carter Tax Institute on Friday, December 11th. He will be presenting to an audience of accountants and lawyers on changes in the focus of estate planning that are likely to result from the increase in the Maine Estate Tax exclusion (from $2 million to $5.45 million). Income tax (capital gains) planning will become more important and many clients will be able to attain their estate planning goals without worrying about estate taxes at all. Rebecca will be teaching a two-night class on Estate Planning through RSU 24 Adult Ed. Everyone who attends gets valuable information out of it. Jeff and Nic will give a brief presentation at Parker Ridge Retirement Community on issues facing elders, including abuse and how to have your documents prepared. Jeff will again be a featured speaker at the annual tax seminar at the University of Maine at Presque Isle (UMPI) on Friday, 10/28. This is an annual gathering of attorneys, accountants, life underwriters, and other financial professionals who seek to learn more about issues facing their clients. He will giving a presentation on the update to the Maine Estate Tax Exclusion and will provide his insight on planning needs after January 1, 2016. 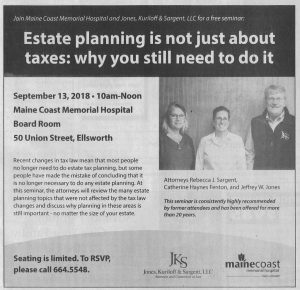 Jeff, Roberta, Rebecca, and Nic will be presenting at Maine Coast Memorial Hospital’s fall estate planning seminar from 9 a.m. – noon each day. Topics to be covered include: the basics of wills, probate, powers of attorney; on the second day we cover trusts and MaineCare asset protection planning. Pre-registration will be required as there is limited seating; please call the hospital directly at 664-5348. Asset Protection for Long-Term Needs: Nic will explain how to protect assets should you need MaineCare coverage. He will explain asset and income limits, the five-year penalty period caused by gifting assets, estate recovery, and how to properly plan for the future to protect your assets. He will explain the different rules for married vs. single people. Introduction to Estate and Legacy Planning: Roberta will discuss the importance of planning ahead so that you maintain control over how you want to be cared for if disabled, choosing the right people to make decisions for you, as well as how your assets are distributed on your death. Without meaningful planning, the Probate Court and Maine law will will decide for you! Also, we will discuss how you can leave a legacy that is more significant than money and property. Jeff will partner with a local Edward Jones representative, Jerry Troger, to do a seminar on estate planning. 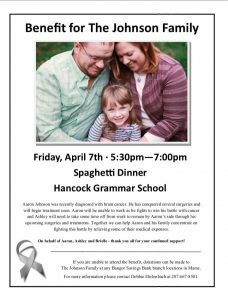 It’ll be held at Betty’s Hilltop House in Ellsworth and will go from 5:30 to 7:30pm. If you would like to attend, please RSVP to Jerry at 207-667-9216 or via email. Jeff will be again participating in the summer meeting of ACTEC. The American College of Trust and Estate Counsel is a national organization of approximately 2,600 lawyers elected to membership by demonstrating the highest level of integrity, commitment to the profession, competence and experience as trust and estate counselors. Jeff is one of an elite group of 25 lawyers that hail from Maine. Jeff will be presenting an estate planning seminar with local Edward Jones Rep, Jerry Troger. 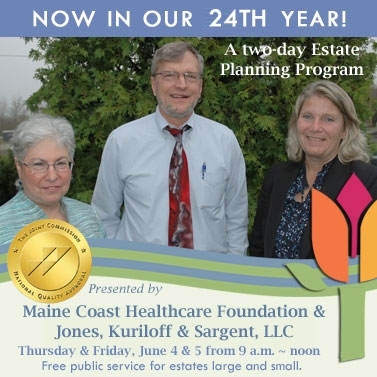 Jeff, Roberta, Rebecca, and Nic will be presenting at Maine Coast Memorial Hospital’s summer estate planning seminar from 9 a.m. – noon each day. Pre-registration will be required as there is limited seating; please call the hospital directly at 664-5348. This is the 24th year that MCMH has hosted the Estate Planning Seminar. 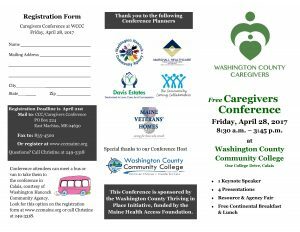 In this workshop, Roberta will talk to you about some of the important MaineCare (Medicaid) regulations and how they impact a family’s income and assets; how to preserve an estate while at the same time insuring adequate care for those you love; the importance of medical and financial powers of attorney, how to plan for children with disabilities or special needs; how to plan for our own possible disability without the necessity of going to court to do so, and how to avoid the common problems of simple wills, joint tenancy and planning with beneficiary designations. 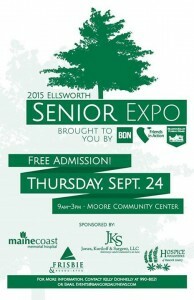 This class, offered by Sunrise Senior College in Machias is free and open to the public. Thursday, 5/28/15, from 1-3pm. 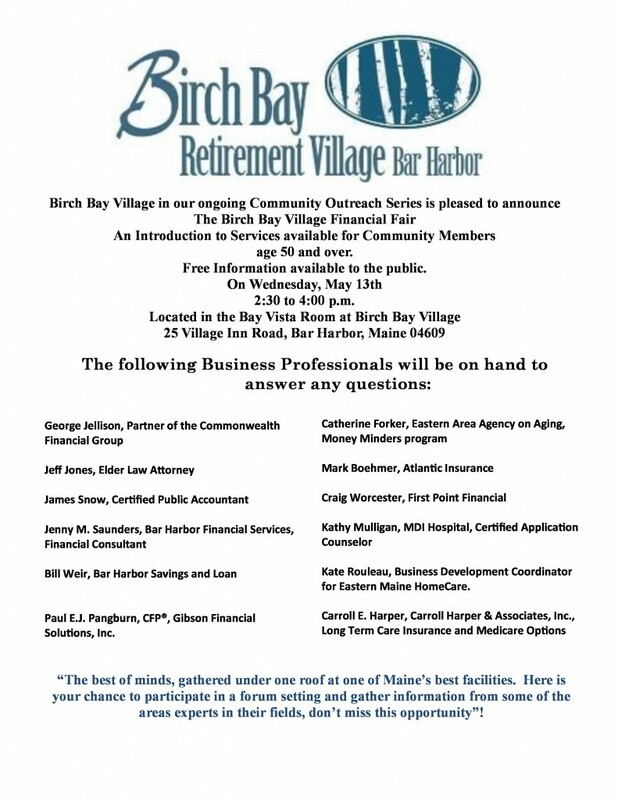 Jeff and Nic will be presenters at this community event being organized by Birch Bay Village. Rebecca will be teaching a course on Estate Planning through RSU 24 Adult Education at Sumner Memorial High School in Sullivan. One of the best gifts you can give your loved ones is organizing your estate now. It’s more than just wills. It’s trusts, long term care, living wills, healthcare and financial powers of attorney, and more…with the plan to protect and transfer important assets to your loved ones. 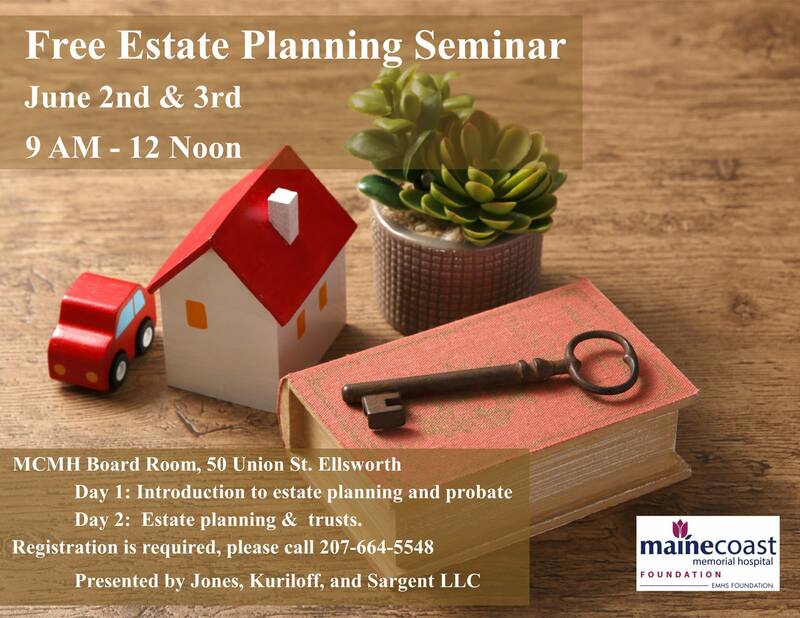 Students will receive a broad overview of the probate process in Maine, as well as information concerning estate taxes and estate planning techniques. We will discuss the noted topics above and other topics of interest to you. This course meets Tuesdays from 6:00 pm to 8:00 pm for 2 weeks. Please visit their website for more information and to enroll in the class. We are delighted to be one of the sponsors of the 20th annual Hospice Auction. 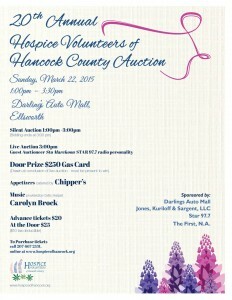 It will be held on Sunday, March 22nd from 1 to 3:30pm at the Darling’s Auto Mall in Ellsworth. Jeff will be again participating in the annual meeting of ACTEC. The American College of Trust and Estate Counsel is a national organization of approximately 2,600 lawyers elected to membership by demonstrating the highest level of integrity, commitment to the profession, competence and experience as trust and estate counselors. Jeff is one of an elite group of 25 lawyers that hail from Maine. He will attend continuing education programs on all the “cutting edge” topics applicable to our trust and estate practice, and he will also be a presenter to two national committees. 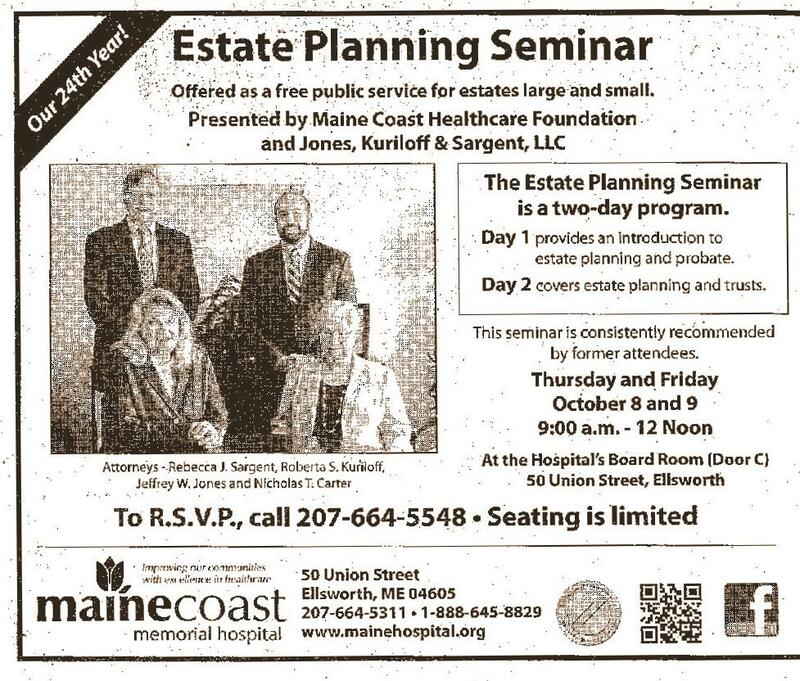 Jeff, Roberta, and Rebecca will be presenting at Maine Coast Memorial Hospital’s fall estate planning seminar on October 9 and 10, 2014, from 9 a.m. – noon each day. Pre-registration will be required as there is limited seating; please call the hospital directly at 664-5348. This is the 23rd year that MCMH has hosted the Estate Planning Seminar. Roberta will be a guest speaker at a presentation on Asset Preservation presented by J.T. Rosborough at 10AM. 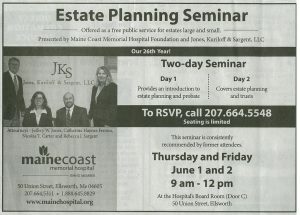 Jeff, Roberta, and Rebecca will be presenting at Maine Coast Memorial Hospital’s summer estate planning seminar on June 5 and 6, 2014, from 9 a.m. – noon each day. Pre-registration will be required as there is limited seating; please call the hospital directly at 664-5348. This will be the 23rd year that MCMH has hosted the Estate Planning Seminar. Rebecca will be instructing at the American Bankers Association’s in-bank trust school for Wells Fargo in Saint Louis during the last week of April. The program is in preparation for the CTFA (Certified Trust and Financial Advisor) Program for the Institute of Certified Bankers. She will be teaching courses on Estate and Guardian Administration, Fiduciary Law, Administration Issues for Disabled Clients, and Planning for Minors. Jeff will be again participating in the annual meeting of ACTEC. The American College of Trust and Estate Counsel is a national organization of approximately 2,600 lawyers elected to membership by demonstrating the highest level of integrity, commitment to the profession, competence and experience as trust and estate counselors. Jeff is one of an elite group of 25 lawyers that hail from Maine. His time at this meeting will include making a presentation to the Communications Committee and attending meetings of the Practice Committee (where they will be putting the finishing touches on a new Guide for Trustees), Technology Committee, and Asset Protection Committee. He will attend continuing education programs on all the “cutting edge” topics applicable to our trust and estate practice. ensure that if you become disabled you avoid the necessity of having the probate court appoint a guardian and conservator. This is a subject for everyone, but particularly retirees and people over 50. Jeff will be participating in an all-day meeting of the Probate and Trust Law Advisory Commission (PATLAC) in Augusta on January 30. This is the next phase in a project, requested by the Legislature, to review and modernize the Maine Probate Code, which was adopted in the 1970s. Jeff is the Chair of the project, which began in January of 2013. The first phase involved 39 lawyers from around the state, who were divided into 7 subcommittees to study the various parts of our probate code and consider possible changes. In this second phase, the 9 members of PATLAC (all appointed by the Chief Justice or the Governor) will review the reports of the project subcommittees and develop a proposed draft of a revised Maine Probate Code for eventual submission to the next Legislature for possible enactment in 2015. Roberta will be giving a presentation at Blue Hill Memorial Hospital for its staff regarding MaineCare issues. Jeff will a presenter at the 41st Annual Frank M. Carter Tax Institute on December 6th. The Frank M. Carter Tax Institute at Husson University, the Penobscot County Bar Association and the Maine Society of CPAs are co-sponsors of this event designed to enhance practitioners’ ability to serve clients. Presentations will give attendees a sense for significant regulatory changes in 2013 in areas of Estate Tax, Health Care, and Banking and Finance. Federal and State Tax updates and an Ethics presentation will round out the event. Seating is limited. Please register by calling 664-0002 or emailing Susan or Jen. Rebecca will be teaching a course on Estate Planning through RSU 24 Adult Education. One of the best gifts you can give your loved ones is organizing your estate now. It’s more than just wills. It’s trusts, long term care, living wills, healthcare and financial powers of attorney, and more…with the plan to protect and transfer important assets to your loved ones. Students will receive a broad overview of the probate process in Maine, as well as information concerning estate taxes and estate planning techniques. We will discuss the noted topics above and other topics of interest to you. Rebecca will involve other experts from these topic areas to assist. Students registering for this class will be automatically registered for Funeral Options: Managing Your Last Affair on 11/6 with Chuck Lakin for FREE. This course meets Wednesdays from 6:00 pm to 8:00 pm for 3 weeks. 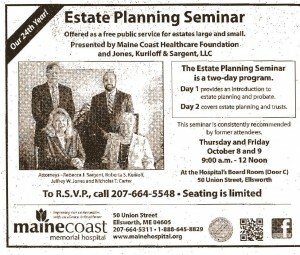 Jeff, Roberta, and Rebecca will be presenting at Maine Coast Memorial Hospital’s fall estate planning seminar on October 10 & 11 from 9-12 each day. Pre-registration will be required as there is limited seating. 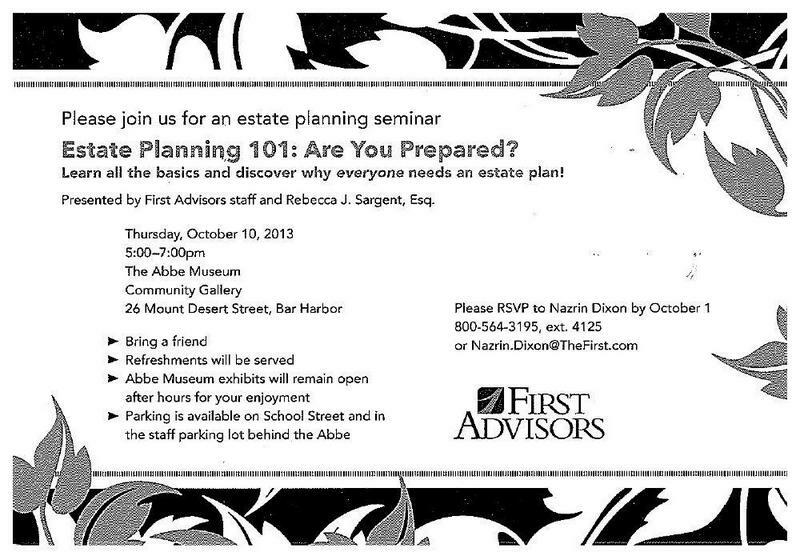 Rebecca, along with the staff of First Advisors, will be presenting a seminar called “Estate Planning 101: Are You Prepared?” It will be at the Abbe Museum on October 10 from 5 – 7pm. Please remember to RSVP if you plan to attend. 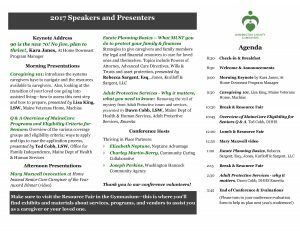 Rebecca will be a Speaker on estate planning issues at the Senior Spectrum Annual Program in Damariscotta. In particular, her talk will focus on how you deal with real estate assets in an estate. The event will be held at the Church of Latter Day Saints on Rte 1.